So, Barcelona go level on points with Real Madrid at the top of La Liga. We've been here before. Can Rafael Benitez's handle the pressure and stay at the summit? Will Barca pull clear before Lionel Messi returns from injury? One thing's for sure, another intriguing race for the title is developing in Spain. Thanks for your company. Until next time. Big news at the top of Serie A where Roma have replaced Fiorentina at the summit after a 2-1 away win over their title rivals. Khouma Babcar scored a late goal for Fiorentina but earlier efforts by Mohamed Salah and Gervinho earned Roma the points. Roma are two points ahead of Fiorentina, Inter Milan and Napoli who all have 18 points. 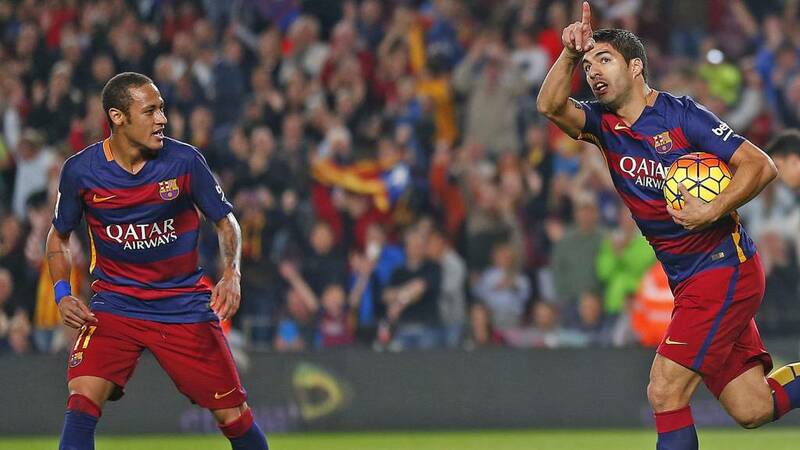 That is Luis Suarez's first hat-trick since he scored a treble in an 8-0 win over Cordoba on 2 May. Ten-man Barca draw level with Real Madrid on points at the top of La Ligga after a hard-earned win. Eibar leave with their heads held high. A pushing contest between Neymar and Ander Capa results in both players being booked. This game is ending in a flurry of cards. Eibar have put up a brave fight but they are going away with nothing. They can at least take this battling display into the rest of their season. They started today in sixth spot - and they deserve to be there on this evidence. Absolutely brilliant by Luis Suarez. His team is down to 10 men but Suarez puts the game out of Eibar's reach with a sublime finish to seal his hat-trick. Wonderful control with his chest to bring the ball down and drill home from just inside the area. Barca fans are out of their seats to applaud the forward. Has Javier Mascherano just handed Eibar a way back into this? The former Liverpool is shown a straight red card for something he has said to the referee after Eibar had conceded yet another free-kick. Barca are down to 10 men for the final few minutes. Barca are 10 minutes away from drawing level on points with Real Madrid at the top of La Liga. This has been much harder than Luis Enrique's side could have envisaged. Eibar have been terrific. Barcelona are getting closer and closer to a third goal. Another free-kick just outside Eibar's box. Neymar this time gives way to Ivan Rakitic who is not far away. Luis Suarez can smell a hat-trick. He attempts an audacious lob from long range which flies into the crowd behind the goal. The Uruguay forward smiles and raises his hand in acknowledgement to team-mates who were screaming for a pass. Credit to Eibar. They have not given up on this. They are prodding and probing the home defence but they are beginning to leave gaps at the back. Gonzalo Escalante is playing a dangerous game. He's just been booked and is then involved in an off the ball collision with Neymar just outside Eibar's area. The crowd is howling but the referee is not interested. Neymar's free-kicks have been disappointing this game. His latest fails to clear the wall. Are Barca saving themselves for El Clasico next month? This has been a scratchy performance by their usual high standards. Another foul on Neymar. Another free-kick to Barca within shooting range. Best debuts you have seen? Is Eibar's night starting to unravel? Busy forward Simone Verdi is coming off with an injury momoments after Barca's Ivan Ratikic is booked for a foul on the player. The mood inside the Nou Camp has changed significantly. Noise echoes around the famous ground now the hosts are ahead for the first time. What a start to the second half. Momemts after Eibar miss a chance to take the lead, Barcelona do find the net as Luis Suarez drills home from just inside the area after Neymar's pass. It's a great finish by the former Liverpool player but Eibar will be kicking themselves. Tough challenge ahead for them now. Eibar fans have enjoyed some wonderful moments over the last two years. But securing a draw against reigning European champions Barcelona at the Nou Camp would top them all. Paulo Dybala and Mario Mandzukic scored as Juventus continued their recent revival with victory over Atalanta. Argentina international Dybala found the net in the 28th minute with a shot from outside the area after good work from Paul Pogba. Mandzukic doubled the lead with a close range effort early in the second half from Dybala's assist. The defending Italian champions, who took one point from their first three games, climb to 12th in the table. It's half-time in the big game in Italy. Roma are heading for the Serie A summit after goals by Mohamed Salah and Gervinho earn them a 2-0 lead at Fiorentina, who started the day at the summit. A scoreline and a performance that will be welcomed in Madrid. Barca need to up their game. Even Neymar's magic from free-kicks have deserted him. Barcelona win a set-piece within sight of the Eibar goal but the Brazilian's curling effort fizzes well wide. Eibar have already made history by scoring their first goal against Barcelona. Can they now pull off one of the biggest shocks in recent times in La Liga? They're certainly giving it a good go. Keko does well to round the keeper but his effort is just about scrambled clear. The green shirts of Eibar are running themselves into the ground. This has been a terrific effort from the smallest club in La Liga.Can they sustain this right to the end? Barcelona might have drawn level but they are far from their best. Another attack involving Luis Suarez ends in Sandro Ramirez volleying well wide with the outside of his boot. Eibar are certainly not short of confidence. The Basque club weather a wave of Barcelona attacks to break on the counter. Simone Verdi tries his luck from outside the area - it's not a bad effort as it smashes into the side netting. Barca's defence is looking a little vulnerable. Is Fiorentina's reign at the top of Serie A coming to an end? The leaders are now 2-0 behind at home to Roma, former Arsenal striker Gervinho getting the second. Test of character for Eibar now. They started so well but are beginning to creak. Normal service is resumed A fine team move ends with Luis Suarez heading home unchalleged from close range after Neymar and Sandro combined. Barcelona have had one effort and target - and scored. Television cameras pick out Lionel Messi in the crowd. He looks bemused by what he is seeing. How he would like to be on the pitch. Barcelona are stikll struggling to get out of second gear. Applause rings roundthe Nou Camp - but it's nothing to do with what they are seeing on the pitch. It's in tribute for Johan Cruyff, the 68-year-old Netherlands great and three-time Ballon d'Or winner who has lung cancer. Hands up. Who predicted this? Barcelona's fans look stunned. Barcelona's poor run without a clean sheet continues as Eibar score stun the Nou Camp with their first ever goal against the Spanish giant. Barca's defence is easily sliced open, Keko denied by Claudio Bravo but the ball the keeper can only push the ball into the path of Borja Baston to fire home. Nice touch by Barcelona's players who came out on to the field before the game with orange T-shirts with the message of support for Johan Cruyff after it was confirmed he had been diagnosed with lung cancer. But the hosts are off the pace as Eibar go close through Ander Capa after he is allowed to run unchallenged before shooting from 15-yards. After 16-year-old Gianluigi Donnarumma's winning first appearance for AC Milan, what are the best debuts you have witnessed? This is Barcelona's worst start to a league season for eight years but that has not stopped another huge crowd pouring into the Nou Camp. Incredible but true...Barcelona have not kept a clean sheet in their last six La Liga game. Luis Enrique's side have conceded 11 times in that period. "People are asking about clean sheets, but for me the most important thing is just to make sure we win the game," said Enrique. As well as Barcelona, we're also keeping an eye on a huge game in Italy, with leaders Fiorentina hosting third-placed Roma. Fiorentina, who have not won Serie A since 1969, will open up a three point lead at the top of the table if they win while a defeat will hand Roma a two-point cushion at the summit. That match kicked off at 17:00 GMT and Roma have taken an eearly lead through Mohamed Salah. Barcelona-based Spanish daily sports newspaper Sport highlight the goalscoring records of Neymar and Luis Suarexz without Lionel Messi. Barca have scored 12 goals since Messi went off with knee ligament damage on 26 September, with Neymar and Suarez scoring nine of them. Messi is hoping to be back in time for El Clasico on 21 November. After 16-year-old Gianluigi Donnarumma's winning first appearance for AC Milan, we want to know the best debuts you have witnessed. What a day for 16-year-old goalkeeper Gianluigi Donnarumma. The AC Milan youngster was handed his debut for the seven-time European champions against Sassuolo - and helped Milan to their first victory in four league games. Milan boss Sinisa Mihajlovic opted to replace former Real Madrid keeper Diego Lopez, 33, with Donnarumma, who was born in 1999. The hosts took the lead through Carlos Bacca's penalty after Sassuolo keeper Andrea Consigli was sent off. Domenico Berardi levelled before Luiz Adriano scored Milan's late winner. Donnarumma is the youngest ever goalkeeper to start a Serie A match. Barca make three changes to the side that started the 2-0 win away to BATE Borisov in the Champions League on Tuesday. Keeper Claudio Bravo, midfielder Ivan Rakitic and forward Sandro Ramires all return - with Sergi Roberto, Marc-Andre ter Stegen and Munir El Haddadi making way. A Barcelona win will send them level on points with Real Madrid at the top of La Liga - four weeks before the first El Clasico of the season. The trouble is Eibar have made a fine start to their second season in Spain's top flight. Four years ago they were playing in the third level of Spanish football. Right now, they are the sixth best team in Spain. One club is a European giant who have won their domestic title 23 times. The other is a small club in the Basque country with no major honours. One spent £75m on a global super star in the summer of 2014. The other spent 75,000 euros on a winger. When it comes to David versus Goliath stories, modern-day football surely doesn't have anything better to offer than Eibar's trip to Barcelona.